Have you seen the Pupils' Zone? Play games, and visit some cool websites. You can vote for your favourites! Our Easter competition was a huge success! Thank-you for all your fantastic eggs! Enjoy your Easter prizes. Crazy hair day in Holly class!! Legoland! Reception had lots of fun at Legoland. We saved the lego princess, looked at fantastic lego models, built lego vehicles to race down ramps and found out how lego is made. What a fab day out! World Book Day! We had a fantastic assembly for World Book Day and talked about our favourite characters fro my stories we love. Can you guess who these two children are dressed up as? Holly class made peppermint creams for Mother's Day. We had a stay and play and sang a song about how much we love our mummies. Problem solving during continuous provision! Peter spent a long time making a track starting from a chair. Super! Holly class have been making dinosaurs using pasta! We are doing really well at writing sentences in Phonics using the sounds and tricky words we have been learning. 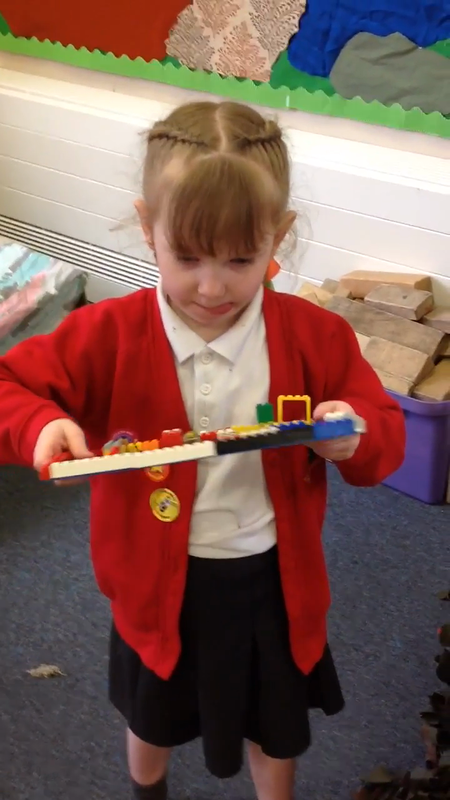 In Maths this week we are learning about weight. We have used the scales to weigh objects and talked about whether they are heavier, lighter or balanced. Then we estimated how many cubes we would need to weigh the same as different objects around the class. We needed lots of cubes for the heavier objects! Snow day!! We wrapped up and put our wellies on to play outside in the snow! 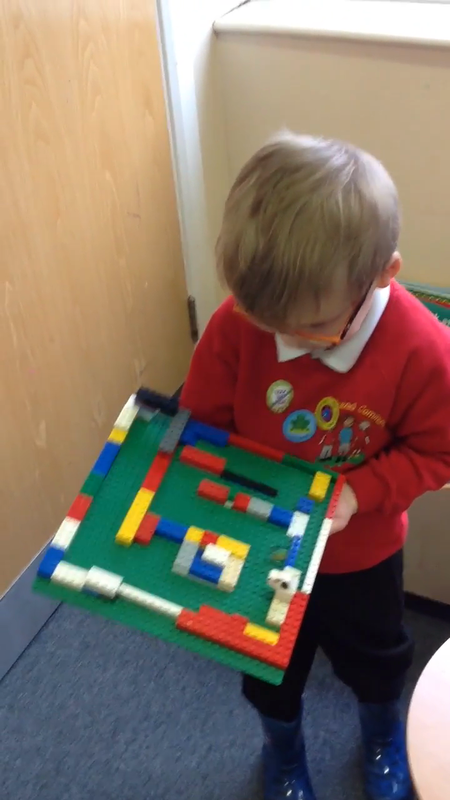 Brain week STEM challenge - look at our fantastic marble mazes using Lego. Brain week STEM challenge - As part of our brain week, Holly class have been designing and making marble mazes using lego and marbles. 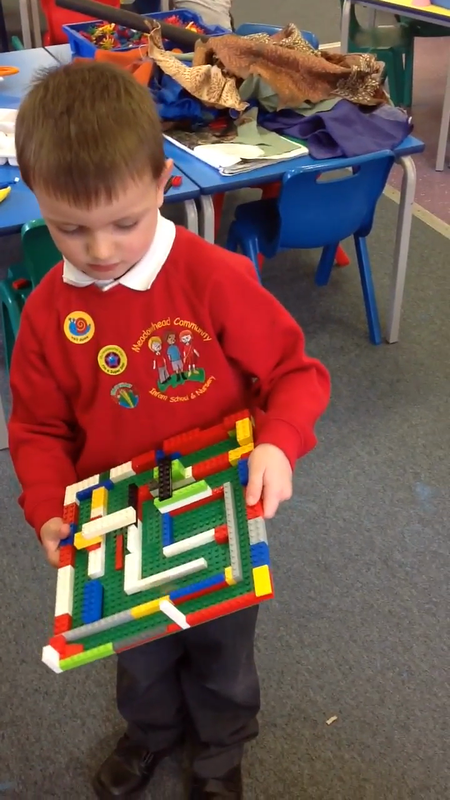 The children designed their maze and then made it. They had to think very carefully and adapt their models to stop the marbles from falling out of their maze. We found DINOSAUR eggs on our healthy walk around school! They were on their own in a nest and we don't know where their mummy is. We decided to take them back to our classroom to talk about and baby dinosaurs hatched out of them. We are going to learn all about dinosaurs so that we know how to look after them. The toys from the museum have got muddled up. We worked as a team to read the labels and put them back where they belong! Where are the toys hiding? After reading 'Lost in the Toy Museum', we worked in groups to be detectives and to help Bunting find out where the toys are hiding. We drew our ideas onto sheets of paper. Some of our ideas were - "The toys are at my Grandma's house playing with my toys. They went there on a bus - they must have!" "They made a map for Bunting to follow so that it could lead him to them." We love to be scientists! Every week we do a different science experiment. Teddies were stuck in the ice and we predicted what would make the ice melt the quickest. We found that salt melted the ice the quickest out of all of the things we used. Welcome to our scrapyard! We use large junk such as crates and pipes to make lots of things such as pirate ships and vehicles! Toys! We are learning about toys as part of our new topic. The children have brought some of their favourite toys into school this week to talk about and do some observational paintings. This week in Maths children are learning to add two groups together and find the total. They rolled two dice and counted that many vehicles into the two garages. Then they counted all of the vehicles to find the total and looked at it written down as a calculation. Snow day ❄️⛄️ The children loved making footprints in the snow. Holly class helped to decorate our Christmas tree in the hall. We sang some Christmas songs to get into the Christmas spirit. As part of our topic about 'Celebrations' we have been learning about birthdays. Our class teddy, Timmy teddy has turned 5 this week so we had a party for him in Holly class. The children made birthday cards, birthday banners and paper chains. They wrote a recipe to make sandwiches and ate them at the party. We sang 'Happy Birthday' and played some party games. Then we had some delicious birthday cake. After reading 'Kippers Cake' we decided to make the cake in class as part of our taste test!! We added cornflakes, beans, milk, ketchup, sugar and jam!! Some children thought it was delicious and asked for seconds!! As part of our topic about senses we tested our sense of smell by doing a smell test. Lots of children identified the different smells such as coffee and shower gel. Our stay, play and learn session was a success! Lots of parents came to play alongside the children in our classroom and look at the learning we have been doing before finding out how we teach the children to read in Reception. We have been learning about our senses. We decided to make some chocolate crispy cakes for our end of term party for ourselves and grown-ups to enjoy. We thought they were delicious!! In Little Big Maths we ordered the numbers to 10 during an independent challenge and then counted to correct amount of objects onto the correct number tile. We have been learning about 'taller' and 'shorter' in Maths and comparing the height of our friends. We ordered ourselves from tallest to shortest. In PE we have been using the benches to travel in different ways to travel. Super balancing Holly class! We love to use the outdoor learning areas to learn, explore, travel and have fun!! Baking in Holly class!! We decorated our biscuits with sweets and made a smiley face. They were delicious!! Lunch time in Reception! The children have enjoyed having their lunch at school and are learning to be independent - queuing up to get their lunch and using the cutlery. Welcome to Holly class! Our new children have settled in so well. We feel very proud of them all. Here are some photos to show you some of the exciting things we have been up to in the classroom and during outdoor play.